Elementary deduction huh? If this is by Rood it will be a tough challenge and not elementary. But wait a minute! They never waste words: are we going to deduct an element (maybe a chemical one?) from each clue? A quick run through a rather tough set of clues suggests that this is precisely what we are doing. You would have to be stone cold sober to set this sort of thing but my scan through the clues suggests that these two setters are still members of the Listener Setters Tipsy Club with “Evil fool nearly drunk (5)” So (NI[T] + (Ti)GHT). Reassured of that our solve began. After several hours of steady solving, extracting elements, we were able to construct a message “INITIATING AT COLUMN FIVE, USING D, OBTAIN EVERY FIFTH CLOCKWISE” then “CARE WITH POSITION OF TINY PARTICLES”; this confirmed that we were in the realms of chemistry, and, as our grid was almost complete, I began to read round the perimeter of the grid. Not far enough, at first, and my amazement knew no bounds when I read round a second and part of a third time and received a rather ambiguous message. “DRAW RINGS OF ATOMIC NO FIVE (or was it SIX?) There was a clash between GOAF/SLANK, VARIX/VASTY and SITE/SWOOSH. Dilemma! I had to learn about atomic structure and looked up element No 5; there it was, BORON, smiling at me down the centre of the grid if I chose BORON from the SERES/BOSON clash, and the other Numpty gave me a quick course about VALENCY ELECTRONS which conveniently circled the atom. This was astonishing and I was really out of my depth – but happily highlighted that drawing rings round the valency electrons and the two further ones in the centre of the grid. However, there was that final warning about the need for care with the position of tiny particles and my crash course had taught me that small e’s represent electrons. Carbon (which I know is element No 6) was appearing in a climbing diagonal. That should have six electrons and if I chose VALENCE over VALENCY (Chambers allows both) my carbon was perfect. The dilemma grew; there had to be a solution and, of course, there it was in the preamble. “Solvers must highlight one word, whose resultant representation includes all occurrences of a thematic letter (my underlining)(which solvers may prefer to enter in lower case). I repeat – this was astonishing. The thematic element had to be those spinning electrons. 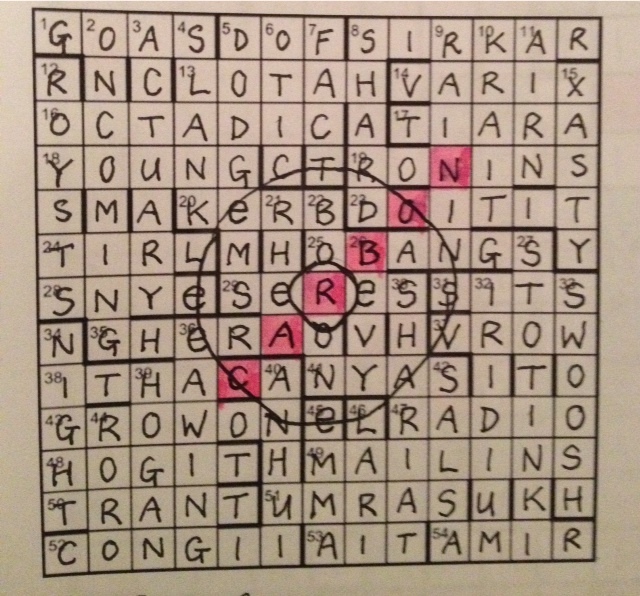 Of course, if I chose element No 6, that e in the perimeter disappeared so CARBON it had to be. This entry was posted on 10 October 2014 at 4:00 pm	and is filed under Solving Blogs. You can follow any responses to this entry through the RSS 2.0 feed. You can leave a response, or trackback from your own site.